How Your Face Shows Happy Disgust : Shots - Health News Scientists are studying the way we show complex emotions. It turns out we're better at it than was previously thought, mixing and matching basic expressions with sophistication — and consistency. We smile when we're happy. But how does a face strike the proper look to show, say, happy surprise? Or happy disgust, like when you're laughing at a really gross joke? A new report, published Monday in the Proceedings of the National Academy of Sciences, shows that we instinctively mix and match actions from the six basic emotions to stitch together more subtle expressions. 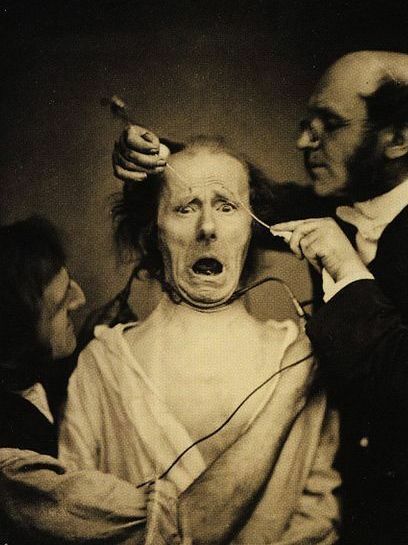 Nineteenth century French neuroscientist Guillaume Duchenne (right) and his assistant force a volunteer to look surprised by electrically shocking muscles in his face. Scientists figured out decades ago that all people use the same set of facial muscles to convey happiness, sadness, anger, fear, surprise and disgust. It wasn't always fun and games in the lab. The study of facial expressions began about 150 years ago, when a French neuroscientist performed a grisly experiment on a few unfortunate volunteers. He stuck electrical probes inside the subjects' facial muscles, and then he forced particular expressions on their faces by sending electrical shocks to various muscles: Make the mouth curl up and the corner of the eyes crease, then voila! The person looks happy. 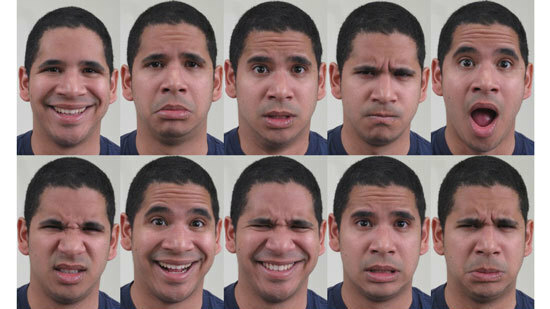 These were the first experiments to show that flexing certain facial muscles could convey a recognizable emotion. "That's insane," says computer scientist Aleix Martinez, from Ohio State University, of the 19th century experiments. "It must have been horribly painful. No one would allow us to do this now." So how did Martinez figure out which muscles get flexed during each expression without sticking electrodes into people's faces? Computer vision. First, he and his colleagues photographed 230 people while they made 21 facial expressions. Then the team wrote a computer program to determine which muscles are flexed in each photo. Specifically, the program analyzed the changes in shape and texture of the volunteers' faces as they shifted from one emotion to the next. For each of the 21 emotions examined, Martinez and his team found that all 230 volunteers used a unique combination of muscles to create that expression. Then some people sprinkled in additional movements to make the expression stronger. "We showed that each of us creates the same emotion category in the same way," Martinez tells Shots. "On top of that, extra muscle actions may help people to convey the emotion more readily." Take, for instance, happily disgusted. "You see this expression on TV all the time," Martinez says. It's when somebody tells a vulgar joke, he says. You're laughing but also grossed out at the same time. "Everybody makes this expression," he says: Combine the smile and creased eyes of a happy expression with the scrunched-up nose and eyes indicating disgust. The same idea gets applied to the other 14 compound emotions tested by Martinez and his team. The test subjects were only Americans, so Martinez doesn't know if these expressions are consistent across all cultures. Nor does he know how well people can read each of the complex emotions. The computer scientist thinks the study is hitting only the tip of the expression iceberg. "We looked at emotions that combine two simple ones. What about triple ones?" he says. "Think about the feeling of despair. ... You feel a combination of angry, sad, fearful. What facial muscles get used then?" The possible combinations are endless. For example, now you're finished reading this blog post, perhaps your face is ... bemusedly curious? Are you particularly good at being happily disgusted? Or sadly angry? Share a selfie of your best compound emotion on Twitter with the hashtag #NPRFaceOff. And @NPRHealth will retweet the best ones.